Participating in a study abroad program anywhere in the world involves important safety considerations. Events in Kenya have received a lot of attention in the news over the past few years, and it is understandable that prospective students and their families may have concerns about the security situation there. We take the safety and security of our students very seriously and wish to allay your concerns about safety during your visit to Kenya for the field schools at TBI. Richard Leakey lives in Kenya and is well informed about security issues since he used to be head of the Civil Service in Kenya, a role in which the police and army reported directly to him. Richard assures you that he would never put anyone in danger and would cancel the field school at any time if he had reason to think that students would be in jeopardy. At the present time, he confirms that traveling to Kenya is safe and there is no reason whatsoever to consider that you will be at any risk by attending the field school. TBI is located in the Turkana Basin in the far northwest of the country. 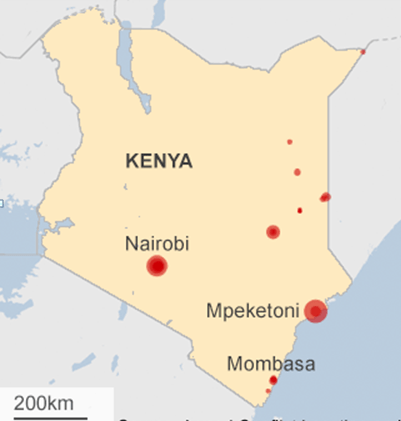 Violent incidents in Kenya have been limited to the coast, the eastern border region adjacent to Somalia and to Nairobi (see map below). Turkana is hundreds of miles removed from any of these locations and, due to the lack of paved roads or railways, it takes several days to get to Turkana from Nairobi by car. The orange arrow shows the approximate position of TBI-Ileret and the blue arrow TBI-Turkwel, the two locations where the field schools are held. 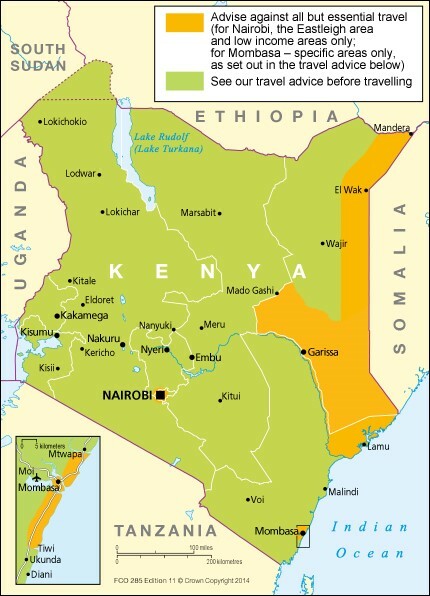 Violent incidents in Kenya have been limited to the coast, the eastern border region adjacent to Somalia and to Nairobi. Turkana is hundreds of miles removed from any of these locations and, due to the lack of paved roads or railways, it takes several days to get to Turkana from Nairobi by car. For the field schools, we have participants who are traveling internationally met at the airport and taken to a safe, nearby lodge that is well outside the city of Nairobi. The next morning, they will be driven to the Mpala Research Institute (operated by Princeton University and the Smithsonian Institution). Then they fly directly from Mpala’s airstrip to one of TBI’s airstrips at Ileret or Nakechichok. While at TBI, students are in a secure fenced compound. Whenever they leave the compound for field excursions, they are escorted by several TBI personnel. After the program, students fly directly back to Jomo Kenyatta International Airport and transfer to their homeward flights. This itinerary ensures that they avoid any of the areas of Kenya that are listed by the US State Department as being of concern. This map is from the UK Foreign and Commonwealth Office and was posted August 13, 2014 and was reported to still be current on September 15, 2016. TBI continues to monitor the security situation in Kenya to guarantee the safety and security of field school participants. Should you have any questions, please contact me at the Turkana Basin Institute, +1-631-632-5800.